In this post, we are listing all the requirements and information you’ll need to start a cannabis business of your own in Canada, as of tomorrow. Before we go any further, you should know that all the information you need to start a cannabis business in Canada is laid out on the official government website. You can read it here, or just download a PDF version. However, since their website can often get confusing and take you to pages that look sort of like other pages but don’t contain all the info, we’ll try to summarize them all in this article. So, in essence, there are three types of businesses that you’ll be able to run as of tomorrow. Alongside these three, there will also be two more that are mostly created for research and development, as well as product analysis. Since those will be rarely applied for, I’ve decided to skip them this time. As for the three listed above, each one serves a different purpose and they aren’t mutually exclusive. In fact, for some businesses, you may need more than just one license. Below, you can see a table that can help future business owners with organizing and fulfilling all the requirements set by the federal government. 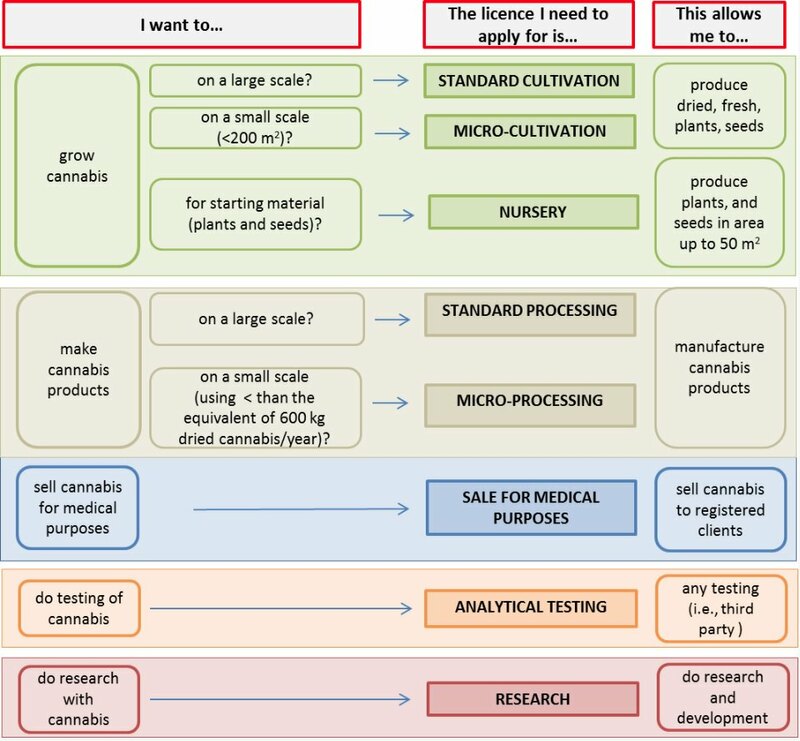 The federal government also created a very nice diagram which will help future business owners to easily determine what type of cannabis license is most fitting for them. The first type is a cultivation license, and there are 4 classes of cultivation licenses that you can get. Each of them serves a different purpose. Keep in mind that these licenses are business licenses, and not for growing at home. Licensed activities cannot be conducted in a dwelling-house as per federal regulations. The standard license is the most demanding of the four. This is the type of license that future licensed producers apply for. The requirements for applying for this license are of the highest levels because the future producer will be held responsible in front of the federal government if any malpractice happens. Micro-cultivation licenses are better suited for those that planning on making a small-time cannabis business. They are awarded for businesses with growing space that is under 200m2 in size. If you were to be awarded with a micro-cultivation license you would be allowed to produce plants and seeds, but you wouldn’t be allowed to sell them if you didn’t also apply for a processing and a sales license. The table above shows you what type of licenses you can apply for at the same time. Consider applying for several at the time in order to cut costs. The nursery license is for those that plan on running a business that helps people grow their own cannabis plants by providing them with seeds, cuttings and such. This license will also allow you to grow plants for your business purposes, however, the surface on which you can grow them is significantly shrunk, down to 50m2. For people that are trying to maximize their growing space in a nursery, some type of vertical growing garden would be perfectly suited. It saves space and yields more cannabis per square meter. The last type of license for cultivation is for growing hemp, but we won’t hang around this one too much. It is the least regulated type of license and the easiest to apply for. If you plan on making cannabis products, no matter if that’s extracting rosin or BHO, making cannabis cigars—you’ll need a processing license. These don’t go the other way around, so if you want one or the other you’ll have to scale up or down, depending on your needs. The requirements for both of the processing licenses are the same, and the only difference is based on the size requirement. As for the sales of cannabis, the whole industry is unified in the sense of the license required to commence sales. Seeing how most businesses that sell cannabis have cannabis on location, we won’t even mention the other type which is for businesses without cannabis on site. The federal sales license will significantly increase the costs of acquiring a license if you plan on running a small business. It will allow you to sell both recreational and medical cannabis, but it is also one of the harder ones to obtain due to all the security requirements. In addition to the requirements for a micro or nursery license, you’ll have to provide proof of visual monitoring in the form of a yearly record, and some type of alarm system. This goes for both monitoring on the perimeter and within the site. You will also have to keep track of every person entering or exiting the area in which you are storing cannabis. Before you start creating your business plan, check out the government website so that you know the whole picture. do you need a location to apply for the federal and provincial cannabis license in Canada? Hi,i was thinking about weed business that will grow and distribute dried cannabis.It will go like that,i can sell you high-end cannabis for lower prize than the standard and the standard will be 10CD/g but i will sell it for 6CD/g I could do both systems,quantity and quality so it will be 40kg for 240 000CD.The question is, what license do i need for this.